When it comes to diving with sharks most of us rely on our instincts alone. However, not this diver. 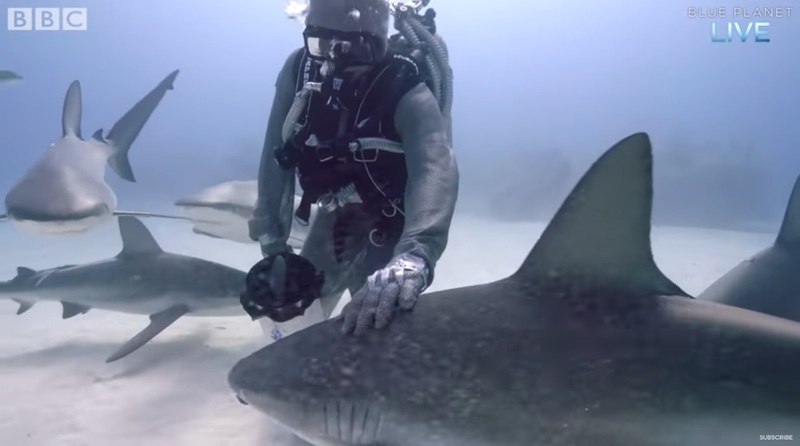 This diver uses both her instinct and an armored suit to dive and interact with a school of sharks. Her name is Cristina Zenato. The suit makes her virtually bite proof and she has been doing this for many years. Watch Cristina put sharks in a trance like state in action in the video below. She states that the armored suit removes barriers that allows her to do things with sharks that she otherwise wouldn’t be able to do. She uses Neptunic and Titanium shark suits. These suits are made of thousands of links of high quality steel-chain mesh. She said amazingly that these suits feel like a second skin to her. A custom made suit costs in the range of about $6.5k. Cristina has been diving in the Bahamas for around 22 years interacting and training a school of Caribbean Reef Sharks. She explains in the video below that the suit is used to prevent the rare accidental shark bite. Watch the video below to watch Cristina explain how this works. Perhaps this diver’s shark rescue, described in a previous post, would not have left permanent marks on him if he had one of these suits. … Who knows? Cristina is a dedicated explorer, educator and conservationist. Find out more about her on her website by clicking here. See next page below where Cristina describe how she puts sharks in a trance like state.